Investors worldwide are living through challenging times, but especially Europeans are finding it increasingly difficult to preserve their wealth. The negative interest rate policy (NIRP) run by major central banks comes at a price. This price is especially high for savers and could become even higher in the future. First, the current central bank policies have a major impact on European citizens’ purchasing power parity. 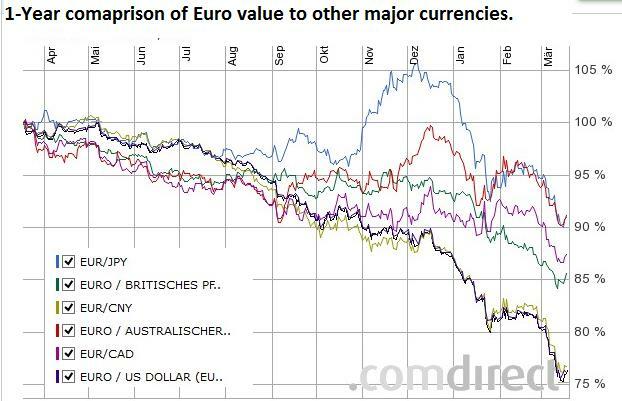 The following graph shows the development of the Euro compared to other currencies – the value loss of the Euro is stunning. 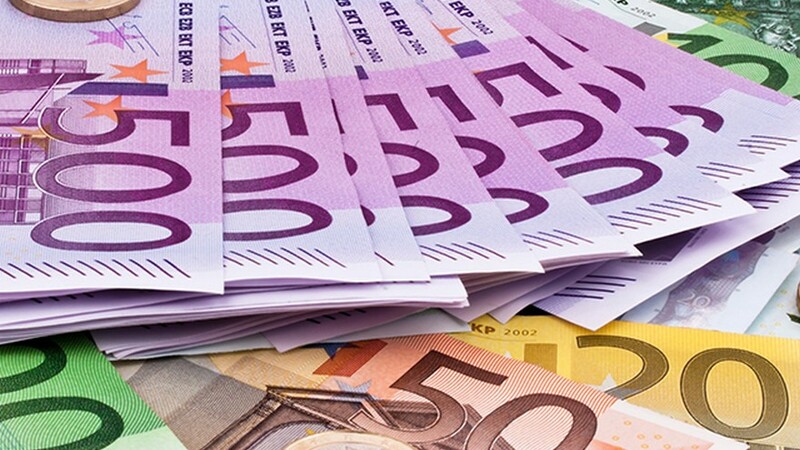 The Euro’s biggest loss, around 25%, is vs. the US Dollar and the Chinese Yuan and within the space of one year! In other words, Europeans got “poorer”, they lost purchasing power. Whereas one year ago they could expect to receive 1.35 US Dollar for 1 Euro, today they get less than 1.10 US Dollar. Products and services from outside the Euro zone became a lot more expensive. A depreciating Euro has, of course, positive effects but these are most obvious for companies in the export business and rising stock markets. Ordinary people usually don’t see the positive effects in their wallets, only the negative, as the family holiday becomes more expensive and so does shopping abroad. The depreciation of the Euro would not be a big problem if the income and interest rates/returns on Euro investments would keep up with the currency depreciation. However, they do not. The second indicator to consider is that easy money and the ultra-low interest rates let to a boom in government bond markets. 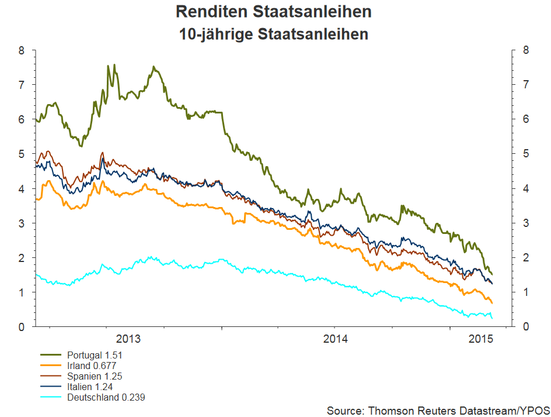 The next figure shows the yield development on European 10-year government bonds. One can clearly see that over the last two years yields were falling. The German 10-year yield already being close to zero. Shorter maturities are already significantly negative. This leads to various problems, which we will discuss later, however, for investors and savers the main issue will be where to invest money for the medium to long-term, such as for retirement? All major European financial institutions currently face this problem, but especially the insurance and banking businesses which offer a high guaranteed future payout to their clients are effected. With high we mean 3% to 4%, which was perfectly possible to achieve in the past by investing in safe investments such as government bonds, but to get such a yield in today’s environment and stay within the prescribed risk parameters is not possible, not even close. Next, the European Central Bank only just started its bond-buying program and will buy bonds worth 60 billion Euro per month for at least the next 18 months. The program aims to boost the economy and revive the labor market in Europe, especially in peripheral countries. It remains questionable whether the measure will achieve this goal. Most financial market participants agree that this program will have a negative impact on the value of the Euro and that tensions between Euro member states are about to rise. After all, who should finance this program, which bonds should be bought and will there be enough bonds available in the market to successfully purchase the intended amount of 60 billion Euro per month? Uncertainty will remain high, but under current circumstances, we expect a further depreciation of the Euro. 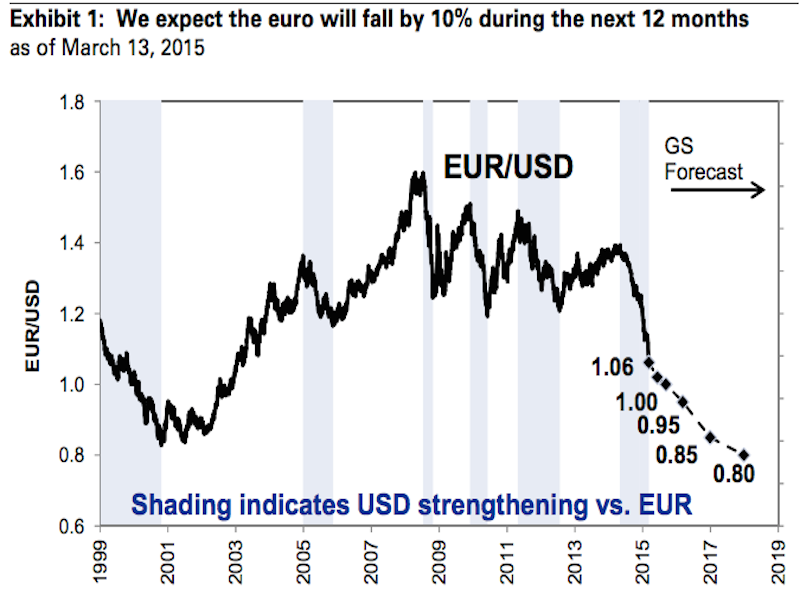 Goldman Sachs forecasts EUR/USD parity within 6 months and an exchange rate of 0.8 USD per Euro in 2018. Investors will have to adapt to this new environment. Old investment strategies and investment products will not give the same security and returns as they did in the past. Governmental and corporate pension plans will be affected heavily in the future due to underperformance of their investments. Most likely this will result in a further extension of the pension age combined with a reduction of promised returns. Every European citizen will face this problem. The Euro devaluation does not hurt at first, but as a consequence everybody loses money directly or indirectly sooner or later. Apart from currency devaluation, price inflation and taxes on capital earning ultra-low interest rates on saving in banks add to the saver’s misery. Some banks have already introduced negative saving account rates. Would you lend money to a bank and pay a fee for lending it? What can you do to limit the loss of value? We still think that the coming crisis will be a debtees’ crisis and not a debtors’ crisis. In the end, tax payers and savers will have to pay for governments’ actions. There is no ‘silver-bullet’ solution for this problem mainly due to the unique personal circumstances that everybody faces. First of all to secure personal wealth it is necessary to be diversified. Investors should not rely on government funding and governmental pension plans. Government obligations will be the first ones to fall short if we run into another financial crisis. Wealth taxation and confiscation can become a major issue. In the European Union we have seen this already in the cases of Cyprus, Greece and Spain where assets where frozen, taken away or punitively taxed. In the future this might happen more often and more drastically. Use safe international legal structures to protect your wealth and the wealth of future generations so that it will be difficult for local governments to interfere with your plans. Diversify your asset holdings, across borders and across different asset classes. Do not rely on government obligations for future retirement planning; this includes classical financial products with a guaranteed return, which mainly invest in government bonds. If you have debts that you can pay back or reduce with free cash consider doing so. Reducing interest costs is also a form of return especially if the alternative is to keep the same money at the bank at negative real interest rates. Limit the portion of your wealth invested in real assets. Real estate, gold, art or anything that can act as a store of value, but be aware that local governments can easily tax immobile assets making them less attractive. Minimize cash holdings in bank accounts, especially Euro cash. Investments linked to government bonds and many financial institutions (especially banks) must be considered with care. We can help you design a diversified portfolio of assets owned via a personalized international vehicle out of reach from national governments. Please contact us for a non-obligatory consultation. We look forward to hear from you. DISCLAIMER: You should make your own enquiries about the investments and we strongly suggest you seek advice before acting upon any recommendation. The opinions expressed in this report are those held by the authors at the time of going to print. The views expressed herein are not to be taken as advice or recommendation to sell or buy shares. This material should not be relied on as including sufficient information to support an investment decision. Any forecasts or opinions expressed are Shoreline’s own at the date of this document and may be subject to change. WARNING: Investing involves risk. The information provided by Shoreline in this document is for general information only, which means it does not take into account your investment objectives, financial situation or needs. You should therefore consider whether the advice is appropriate to your investment objectives, financial situation and needs before acting upon it, seeking advice from a financial adviser or stockbroker if necessary.